In India, there are many possibilities when it comes to getting away from it all. You can get lost in the mountains of the country’s remote Himalayan states. You can go for a jungle safari in Maharashtra. Or you could book in a stay at an Ayurvedic retreat. But right now, we’re enchanted by the idea of a rural, tranquil farm retreat. These five beautiful farmstays in India, all of which are found in South India, don’t skimp on creature comforts – but they’ll also see you surrounded by fragrant spice plantations, cooking with the freshest fare, and otherwise soaking up a bucolic pace of life. 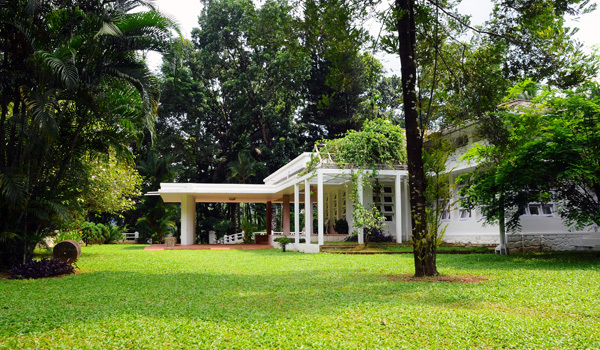 Situated within Kerala’s so-called rubber belt (which is located in the foothills of the Western Ghats, and is still relatively free from tourist crowds), the welcoming Evergreen Estate Bungalow looks out on gorgeously green scenery. As expected, a rubber plantation – and traditional processing plant – are nearby, as are farms where vanilla, nutmeg, and cardamom are harvested. Visitors can go for scenic ambles amidst the mist-shrouded hills before returning for a delicious home-cooked dinner and a relaxed evening on the veranda. 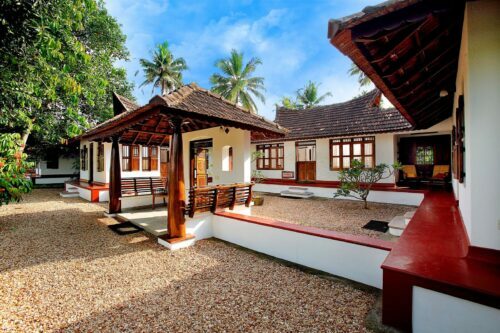 The ancestral home of the Kottukapally family, who have lived in the area for more than a millennium, Nazarani Tharavad is a wonderfully homely farmstay located in Pala, east of Kottayam, Kerala. Visitors will enjoy the hospitality of the family while exploring their historic library, taking in cookery demonstrations and relaxing in the leafy courtyard. 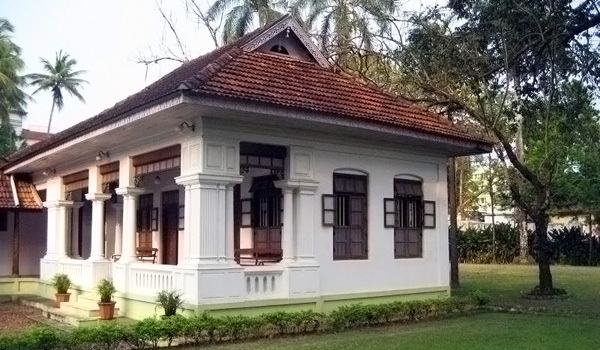 As for outdoor adventures, the hosts’ vanilla farm is worth exploring, while a nearby rubber estate offers the chance to brush up on the area’s agricultural history. Day-trips to Cochin and cruises along the backwaters are also part of the experience. When it comes to farmstays in India, it hardly gets lovelier or more peaceable than Philipkutty’s Farm in the Keralan backwaters. 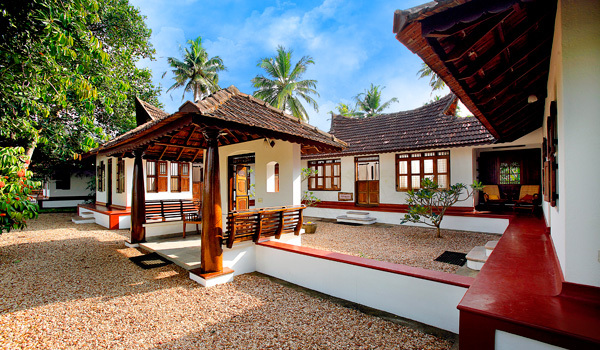 On a farm island along the backwaters, guests spend the evenings in private, waterside cottages. Days can be passed, meanwhile, on the property’s working farm, where fragrant crops like bananas, mangos, coconuts and other spices thrive. For an authentic Keralan experience, the getaway provides an idyllic opportunity to take in the local pace of life (which includes the cuisine – communal meals feature farm-harvested vegetables, house-made yogurt and jams, and other treats). Hidden amidst dense foliage, yet just steps from the gorgeous Arabian Sea coast, SwaSwara is a perfect retreat for nature lovers. While the resort and farmstay is best known as a yoga and wellness destination, its organic farm keep things green – and also supplies the kitchen, which cooks up delectable, traditional recipes that hail from nearby Gokarna. Found in the countryside outside of Bangalore, Shreyas Yoga Retreat invites guests to commune with their surroundings and practice, even for just a short time, a mindful pace of living. 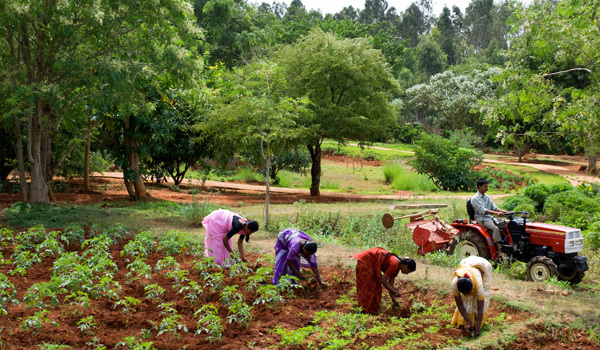 One key aspect of their programme is interacting with the property’s organic garden. Guests can go for a tour of the greenery, but can also get their hands dirty with time spent weeding, harvesting, and otherwise minding the plot. When it comes to farmstays in India, it hardly gets more hands-on than this.